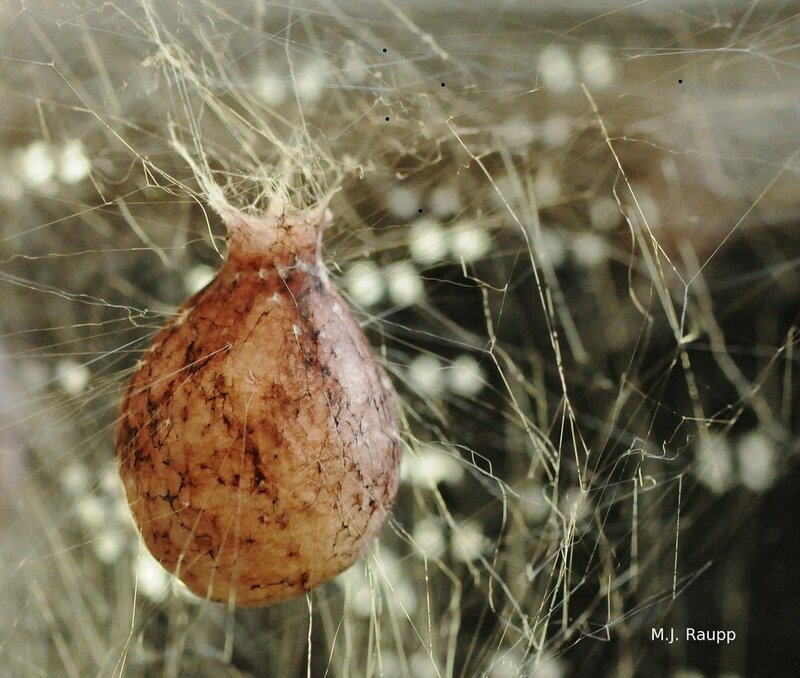 How many spiderlings will emerge from an egg case the size of a large marble? For those of us who dwell in the mid-Atlantic region of the United States, the brown marmorated stink bug has become an inimitable pest attacking apples, vandalizing vegetables, sullying soybeans, and raiding residences. Since its discovery near Allentown, PA in the 1990’s, it has caused millions of dollars of damage to a wide variety of crops. This scalawag has delivered untold distress to millions of homeowners in more than 33 states by invading dwellings. Mischief caused by this exotic invader from Asia has been the topic of several previous episodes of Bug of the Week. For those of you who have had enough of this rascal, over the next few weeks we will visit several predators that know how to give stink bugs the ultimate comeuppance. Last week we enjoyed the curious reunion between the Chinese praying mantis and the brown marmorated stink bug. This week we will see how one of our homies, the black and yellow garden spider, Argiope aurantia, serves up some hospitality for the stink bug. Many of us have shared the experience of wandering along a path through a meadow and bumbling into an enormous spider web ruled by a fearsome yellow and black spider. Argiope aurantia, the so-called black and yellow garden spider, is extraordinarily common this year in some locations. Elvira leisurely devours her prey at the center of the web. Fortunately for Bug of the Week, one of our eagle-eyed graduate students recently captured a gorgeous female garden spider named Elvira who has taken up residence in a large display case in our laboratory. Garden spiders belong to family known as Araneidae, the orb weavers, made famous by E. B. White in his classic tale Charlotte’s Web. Webs of the black and yellow garden spider can be gargantuan, often spanning several feet. You may recall that Charlotte used her web to write eloquent praises for her friend Wilbur in an attempt to rescue him from becoming a porcine feast for farmer John. To my disappointment, Elvira has only somewhat mastered the letter “W” which she copies repeatedly to create a conspicuously large band of zigzagging “W’s” in the center of her web. Spider aficionados call this band of heavy silk the stabilimentum. The function of the stabilimentum is a topic of debate among arachnologists. Some suggest that the band helps disguise the spider from its predators by providing a form of camouflage as the spider rests in the center of its web. Others believe that the silk may act as a tiny parasol shielding the spider from intense rays of the sun. One fascinating study revealed that the conspicuous bands of silk acted as a visual warning to low flying birds, thereby reducing the likelihood of devastating web-destroying crashes much the same way an image of an owl on a large plate glass window dissuades misguided birds from crashing and breaking their necks. Of course, the spider cares not for the welfare of the bird, but repairing bird-damaged webs takes time away from important projects like capturing and eating insects. Although I tried to resist poking Elvira, my curiosity got the better of me and my digital inquiry provoked a remarkable behavioral display. The garden spider retreated slightly from the stabilimentum and began to rhythmically flex and extend its legs. These gyrations set the entire web rocking back and forth in ever-increasing waves. Swaying the web in rhythmic motion is called web-flexing and it is often observed in orb weavers. Web-flexing has been reported as a way to dislodge potential predators or causing prey to become entangled in sticky capture-threads in the web. Flexing may serve other defensive purposes as well. Enemies of the orb weaver include predatory lizards, toads, and other spiders that rely on keen eyesight to locate and capture prey. In an interesting treatise on orb weavers, researcher Wayne Tolbert suggested that web-flexing might be a clever way for the spider to conceal its exact location, thereby confounding hungry predators. As fate would have it, swarms of brown marmorated stink bugs inhabit our laboratories and provide a ready source of food for Elvira. Stink bugs stand no chance once they encounter the sticky strands of Elvira’s web. The speed with which she immobilizes her victim in a silken wrapper is reminiscent of Frodo’s wicked encounter with Shelob in route to Mount Doom. Sometimes the prey is treated to a bite or two from Elvira’s impressive fangs. On other occasions, she simply wraps up the stink bug and later fetches it to the center of the web where victims are devoured. After a week or so of a strict stink bug diet, a very pregnant Elvira deposited an egg case the size of a large marble in an upper corner of her lair. The day after this herculean effort, Elvira was back to consuming stink bugs like they were popcorn. Let’s hope that our spider’s feral kin are showing similar homegrown hospitality to stink bugs wherever they may be. Bug of the Week thanks Ashley for capturing Elvira and our Master Gardeners who recorded some wonderful video of another garden spider dealing doom to a stink bug. Two great articles “Predator avoidance behaviors and web defense structures in the orb weavers Argiope aurantia and Argiope trifasciata” by W. Tolbert and “Do stabilimenta in orb webs attract prey or defend spiders?” by T.A. Blackledge and J.W. Wenzel were consulted for this episode of Bug of the Week. To learn more about these awesome predators, please visit the following web sites.